O ne of Wings’ most understated singles, similar to the low-key “Let ‘Em In.” The keyboards get the cameos here, engaging in some dreamweaving along the way. The flip is the combination of “Backwards Traveller” (one of those wonderful throwaways from Paul) and the instrumental “Cuff Link,” a precursor to the instrumental synthesizer pieces found on McCartney II. 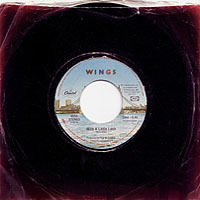 It appears that promotional versions of this single featured an edited version of the A side.